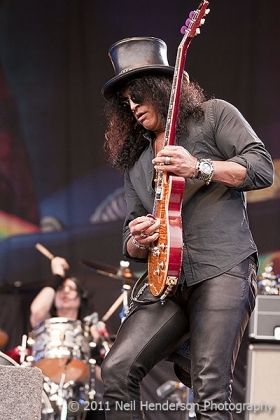 On Saturday evening after Thin Lizzy it was the turn of the guitar legend that is Slash ! This is the man who just over 12 months ago pulled in a crowd at Download for his early afternoon slot that rivalled any of the headliners crowds. Today the crowd is far smaller - a decent size but not as big as I'd expected - possibly a sign of the poor turnout generally. 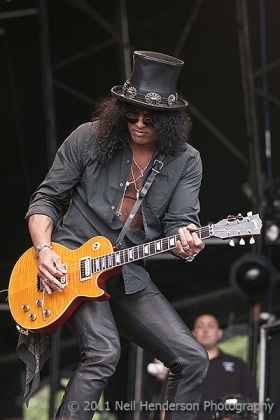 Slash's choice of setlist was a short history of his career, including four tracks from his time with Guns'n'Roses (Nightrain, Rocket Queen, Sweet Child O' Mine & Paradise City), three Slash's snakepit songs (Been there lately, Mean Bone & Speed parade), one Velvet revolver song (Slither), and just two songs from his new album (Ghost & Doctor alibi). I'd certainly expected more new material and less Slash's snakepit and Velvet Revolver material. The early solo stuff (Slash's snakepit) was all good, but many in the crowd seemed unfamiliar with it - perhaps more of the new album would have gone down better, but whenever he played a Guns'n'Roses track the crowd went wild - this was clearly what they wanted to hear. Myles Kennedy has a great voice and handled the Guns'n'Roses tracks with ease. For "Doctor Alibi" he took a break from vocal duties and Bassist Todd Kerns took over and did a fine job.